1. Galvanized bucket -- There were always metal buckets like this around my house when I was growing up. Plastic is just not the same. 2. Hole in My Bucket -- I think there was a song many years ago with this title. I thought it was the funniest thing when my younger sister had a hole in the back of her pants and my father started singing that song. I was thankful that it wasn't my pants. How embarrassing! 3. Oaken Bucket -- I used to see an old establishment by this name on the Old Knoxville Highway in Rockford, Tennessee. I'm not sure what the place was. I think it was closed. It always intrigued me though. The place looked like it was probably open in the 40's or 50's and probably even into the 60's. Maybe someone from that area can enlightened me about this. 4. Bucket Brigade --How many times have you resorted to using the "Bucket Brigade" method to move things along more quickly? 5. Kicked the bucket--Anyone remember the scene in It's a Mad, Mad, Mad World where Jimmy Durante kicked the bucket? This film is one of my all time favorite comedies. 6. Bucket Head-- I guess more than one person in the world has this nickname. My younger brother had a friend they used to call "Bucket Head". Have you ever known anyone with this nickname? 7. Bucket -- This is a term used in basketball that I've heard fans use. Not exactly sure what it means, but I guess it has something to do with the basket. I'm sure one of the readers can explain. 8. Buckets of Rain -- A song by Bob Dylan. 9. Bucket of baseballs -- Makes batting practice easy and baseballs are cheaper by the dozen. 10. Drop in the bucket -- Considerably less than a drop in the ocean, but still a minute fraction of the overall scope of things. So there you have my "Bucket List". What? Are you saying that's not the way I'm supposed to do it? How did that/this get by me? Who needs a bucket list....and does it come with a scrub brush? You're right - the term bucket in basketball refers to either the hoop or making a basket. I used to call my girls buckethead. A great unique bucket list, loved the hole in the bucket. You sneaky so and so. I really wanted to read your "real" bucket list. I like your bucket list, Lee. Hi Lee .. there's a hole in my bucket song comes up occasionally - and it's so catchy .. love the idea of your father teasing your sister ..
and then there's Jack and Jill. I think this is one of your wacky posts Arlee. Nice version of a Bucket List. How about buckets of fun? When I saw the title of the post, the first thing that popped into my head was how funny it would be to do pretty much what you did! Kicked the bucket, in England, meant to die. I saw the movie, don't remember the episode. I went to a concert and heard Harry Belafonte sing this song with a guest. They were laughing so much they forgot where they were so I called out the next line. He picked up on UK accent and replied the same way. Hahaha Lee I wasn't expecting this but it really made me laugh, great post buddy, I'll have to check out that film too, sounds good! I love that scene in Mad World. What a great movie. The remake was pretty funny, too. I need to rent that for my kids to watch. The old one. Maybe the new one, too. Had to be silly today cause I'm too exhausted to be otherwise. Andrew-- What was the remake of Mad, Mad World? I don't recall having heard of it. 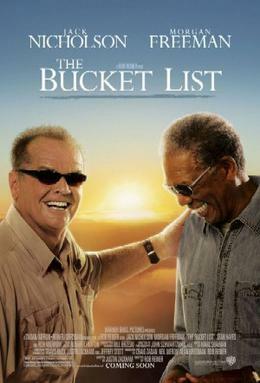 I have never seen a Bucket List quite like this... very funny. Ha, funny. I've actually made a list of 50 things I want to do by 50. I think it's better than a bucket list because it puts a timeline on it -- more like goals. This is certainly a different take on the whole "bucket list" idea. Quite an enjoyable quirk on this theme. This isn't the way a person is supposed to make out a 'BUCKET LIST'! Oh, what's the point trying to explain anything to you? I'm not going to waste my time trying... BUCK IT! What about bucket of bolts or bucket of nails? I seem to remember a mom and pop type hardware store, when I was a kid, where they displayed a lot of nails and bolts in buckets of all sizes. Actually it was a cool place to visit. oh dad! that was funny! I was expecting a real bucket list too! I grew up on a farm so we had some galvanized buckets but in the milking parlor everything had to be stainless steel. Those were some heavy buckets. Clever! Leave it to Lee to put his own personal stamp on "bucket list". Who needs to conform to society and tradition? That Hole in the Bucket song is classic! HA! You're a funny, funny guy. Very clever and creative, Lee. That fits you to a tee...I would add a bucket of balls...like at the driving range! Thanks for the additional comments and recommendations. And thanks, Buck, for giving me the inspiration to do this. Maybe I'll put together my real "bucket list" eventually.